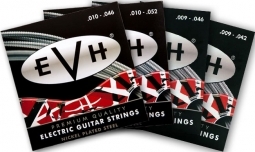 Each collector's tin houses 12 EVH-brand, medium-gauge, .60mm, custom molded nylon picks that feature a speckled, raised surface for superior grip. The custom molded material is super-tough and stands up extremely well to playing day after day. These are the gray Herco picks used onstage by Eddie during Van Halen's historic 2007-2008 reunion tour! A great Van Halen commemorative for musicians and aficionado's alike! 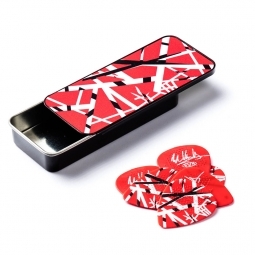 The tin features Eddie's famous Frankenstrat, and both the tin and the picks feature the EVH logo. I originally ordered these just for show, but it turned out to be a great quality pick! Now I use them. (And I have to keep them hidden so my friends don’t swipe them.